An organizational meeting was held at the Portland Art Museum, early in 1927, at which William Gray Purcell was elected President; Clyde Leon Keller, Vice President; and Sally Hart, Acting Secretary. The name of the society was to be the SOCIETY OF OREGON ARTISTS. This new organization had a lot of enthusiasm, but that was about all. However, a committee was formed to draw up a constitution, and another was to arrange exhibits and select a time and place to meet. The Portland Art Museum felt we were a part of their activities and were glad to have us meet and exhibit in their building. Many of our members were also members of their organization. We helped them in their financial difficulties, as individuals and as a group. When they received County assistance, however, it soon developed that the policy of the Museum's Curator and that of the SOCIETY OF OREGON ARTISTS were not the same. It was suggested that we find another place to meet. On December 9, 1929, we decided to incorporate, and as the name "SOCIETY OF OREGON ARTISTS" conflicted with an older society, the name was changed to OREGON SOCIETY OF ARTISTS. Officers were: William Gray Purcell, President; Clyde Leon Keller, Sr., Vice President; Mrs. Harold Dickson Marsh, Secretary. Mrs. Colista Dowling, Wm. H. Drake, Herman T. Bohlman and Mrs. Katherine McRae were Board Members. Clyde Leon Keller generously let the Society meet at his art studio on SW Washington Street near 13th Avenue for many years. He was our third president and did much to see that the control of the Society was kept in the artists' hands. Indeed, to review the records of our Society and the important names that appear, it looks like a "WHO'S WHO" in Portland's art world. As time passed, meetings were held monthly in various places, such as restaurants, halls and in the Public Library. Annual exhibits were held in Meier & Frank's auditorium and in the Public Library. At one time pictures could be taken out on one's library card. It was found, however, that frames became chipped and pictures damaged, so this was discontinued. We were offered a choice building site at Depoe Bay, in 1932, providing we would build and make our headquarters there. But, after much thought, it was decided that it was too far from the center of our activities. In 1939-40 we rented the old school house on Sauvie Island, but found that too was too far from Portland. It became more important, as time went on, that we have a home of our own. Finance, as always, became the biggest problem. We began to plan seriously. The first sketch groups were held on the second floor of the Selling-Hirsch Building on Tenth and Washington; then later moved to a vacant store at SW Third and Hall. The income went into a building fund. Much credit must be given to two artists in particular who gave so willingly of their time and talents - Ed Quigley and Arthur Selander - who conducted sketch groups for several years, giving all the proceeds to the building fund, making construction of the building possible. By means of these sketching groups, picture sales, bazaars, rummage sales, and many other activities, the building fund grew until we thought it safe to purchase land. A debt of gratitude is owed also to Adrian Johanns, the Society's Treasurer for 16 years. The financial success of the project was due largely to his dedicated efforts. The committee selected to find a location inspected vacant lots and buildings in many parts of the city, especially the East Side, as many of our members resided there. However, when Mary Armstrong suggested the beautiful old formal garden of Mrs. T. B. Wilcox, at the corner of SW Park Place and St. Clair Avenue, the beauty of the site and the flowers sold the artists. The committee contacted Mr. Nathan Sohn, the owner, who stated the property was valued at $20,000. This was about four times the amount in the building fund. They invited Mr. Sohn to the next meeting of the Society. When he saw the members and their determination to go ahead, he asked to become a member and donated $2,500 from the purchase price provided that the Society proceed with the plan. This was a staggering sum for a group of poor artists. Mr. Sohn, however, let the Society make its own terms at a low interest rate covering the remaining $17,500. So the land was purchased in April 1953. The membership had increased to over 1,000, all enthusiastic about conservative and traditional art. The Oregon Society of Artists was feeling the need for an educational and cultural center of their own, a place where artists could work and display their pictures free and as a service to the public. We also felt it would be a morale builder to have a place to identify ourselves with; with this in mind every member was eager to start the project. Thayne J. Logan, Architect and Lyle Keeler, Contractor, donated their services and the use of their equipment and organizations to the Society. The contractor constructed the concrete walls and roof of the first 40' x 50' unit (now used as our gallery). Everybody participated and many gave labor. Each weekend Mary Armstrong called the labor group and got them organized. The women even helped to dig the ditch to the street sewer connection and helped to clear the land for the new building. They furnished lunches for the working members. Mrs. Veda Hazelwood headed the rummage sales, and bazaars, and having no place to collect rummage, she kept it in her home until her dining room was filled to the ceiling. Some claimed they could not lay down their hats without Veda selling them. A pair of donated chinchillas was raffled off for $1,500. At a "Greenwich Village Fair" held in the Park Blocks, Portland's Mayor, Fred C. Peterson, gave a speech in our favor. Nearly everybody participated, some giving labor, time, pictures to sell, and some donated money but not to exceed $100. Building material firms donated much of the material, and the building was built, in part, by donated membership labor. It was a "Do it Ourselves" project, and no public funds, donations, foundations or subscriptions were asked for, nor were they offered. Prior to 1940, our meeting notices were hand-written postcards - at that time we decided to give a little more notice to Society activities, and that was the birth of the BRUSHMARKS. Helen Logan was the first editor-in-chief, printer, mailing clerk and distributor. On Thursday, September 23, 1954, the first meeting was held in our new building. From 1953 on, many rummage sales, picture sales, and sketch groups were held by Arthur A. Selander, Ed Quigley, Kate Raymond, Colista Dowling and others to raise funds. At the Christmas Party, December 1956, the mortgage was burned and the building was ours. We soon found our building too small for our expanding activities. In 1957 a temporary storage room, 12' x 20', was added to the northeast corner of the building. Labor again was donated freely by our members. Concrete blocks were used so the room could be removed later. In 1959 we had grown and needed a new wing for our sketch groups and storage space. Thayne Logan again drew plans for a 30' by 80' one-story and daylight basement addition. Part of the money was in our building fund, but the balance needed was raised by offering our members $100 notes at 6% interest. No member was to buy more than $1,000. The $15,000 needed was raised in less than a month with a surplus. As the Society raised the money to redeem the notes, they were paid by drawing from a hat the names of those holding the notes. All notes were paid with interest by 1964, with monies raised from various activities. The new wing was started in the spring of 1960 and was completed in September of that year. James Hickey, Inc., contractor, was awarded the contract. Members selling their pictures in the new gallery made a 10% donation, which was used against the indebtedness. By 1965 our parking was critical. As our building fund was financially in the black, we planned our present parking lot. (This had been promised the City as soon as our building had been completed). James Hickey, Inc., was awarded the contract to build a concrete wall along the east side of our property and a planter along the north side, and to pave the parking lot. This was completed in the fall of 1965, and our members filled and planted shrubs by donated labor. Third Thursday of each month - 8:00 pm - official business meeting, at which the President presides and all business is transacted, followed by an educational program and refreshments. Second Thursday of each month - Day Meeting - 11:00 am - social and educational. Brown bag lunch. Grace Prier has presided for many years. Two outdoor sketch picnics each year and a Ham and Egg Breakfast. Each month the pictures in our gallery are changed and each show is opened with a tea provided by the exhibiting artists. No commission or fee is charged for sale of pictures in our studio. The Oregon Society of Artists is a non-profit corporation. All the stock is owned by the membership and is non-transferable. Today (1981) we own land 100' x 150' at 2185 SW Park Place, with a concrete building 4400 square feet on the main floor and 2400 square feet on the lower area, making a total of 6800 square feet - also a 60' x 100' private parking lot. Membership is by election of the Board and Membership vote, the main requirements being an interest in conservative art and compatibility to the general well being of the Society. Our building fund grows slowly, but we look forward to the day when we can construct our third unit along the north side of our parking lot for small studios for our sketch groups and instructors. During the years, the Society has received many donations, some of which were liquidated and memorials installed for the donors. Mr. and Mrs. Frederick DeNeff donated a beautiful bronze statue; Mr. and Mrs. Erich Porshman, an electric stove and refrigerator; Mr. and Mrs. Thayne J. Logan, a large dining table; Mr. Arthur A. Selander, in memory of his wife, Nettie, a secretary's desk and chair. James Hazelwood donated, in memory of his wife, Veda, a marble base for our bronze statue; Fred Raymond donated the umbrella stand in memory of his wife, Kate. Judge Henry Tomlinson donated a silver service in memory of his wife, Helen, and many other pieces have been added by other members. The Henry Ets collection of art was bequeathed to the Society, and from the funds received an illuminated bulletin board was installed in front of the building. A memorial gallery dedicated to the name of the late Colista Dowling was constructed in 1970, with funds received from the sale of Mrs. Dowling's paintings and lifetime sketches bequeathed to the Society. Many of the art books in our library were originally from the McKay estate, which was the original site of our present building. The Society, through the Board of Directors, has accepted many other art books as space permits. The Society has always been a home for conservative and objective art, built and organized by the members as a "Do it Ourselves" group. We have never employed paid employees of any kind, other than on bid and contract. We are an educational group, not a school or a museum. Our activities consist of sketching groups conducted by individual Active Society members in our building, who teach our members and pay a sum to the Society from the sketch group fees to cover lights, heat and overhead. Any member, either Active or Associate, may vote, hold office or attend sketching groups which are established for members only. Advancement from Associate to Active status requires three months of membership, the approval by a panel of Active judges of three original works done by the members seeking Active membership. Important business matters of the Society are conducted by a Board of Directors, duly elected by the membership, and governed by the By-Laws. Our Constitution states that we are a conservative, recognizable art group. The artists who gave of their labor, time and money, many who are no longer with us, did so to make our building the home of conservative art in Oregon. 1927 Wm. Gray Purcell (1) An architect, interested in sketching and the fine arts. 1928 Wm. Gray Purcell (2) Public Relations and Art Director in World War I. 1929 Wm. Gray Purcell (3) A good organizer and believer in traditional art. 1930 Judge H. M. Tomlinson A lawyer. Painted in oil as a hobby. Very civic minded. 1931 Clyde Leon Keller An artist and art dealer. Known as "Keller the Art Man." Gave generously of his time and use of his store for the Society. A good traditional artist. 1932 Ben Larsen (1) An artist. The Society was considering an offer of site at Depoe Bay. Incorporated officially as "The Oregon Society of Artists." 1933 Albert Gerlach (1) Art Glass artist. The Society was having growing pains and other groups were trying to grab our membership. 1934 Thayne J. Logan (1) An architect. Artist as hobby. Both water color and oil painting. Unified the Society. 1935 E. D. Morgan Fowle Government service employee. Oil painter as hobby. Extended activity of Society. 1936 F. W. Sercombe A lawyer. Artist as hobby. Revised and had printed our Constitution, at his expense. 1937 George McBride Government service, Marine Inspector. Oil painter marine subjects. Expanded art activity. 1938 Ben Larsen (2) An artist. Gave liberally of his time to OSA affairs. 1939 Thayne J. Logan (2) An architect. Society expanding. Good educational programs. 1940 Harold McMahon Window trimmer. Artist as hobby. Started "Brushmarks" as society news bulletin. 1941 Thayne J. Logan (3) World War II started. Many members called into service. Just holding society together was problem. 1942 Daniel Powell (1) High school teacher. Sculptor, sketch artist. War Year. 1943 Daniel Powell (2) War Year. Held regular meetings. 1944 Daniel Powell (3) War Year. Educational program started, again stressed traditional art. 1945 Albert Patecky (1) An artist. Telephone Director Sales. Expanded exhibits. 1946 Menalkas Selander An artist. Expanded educational program. 1947 Albert Patecky (2) An artist. Fiscal year changed from January to April 30, 1948. 1948 Frank Boynton (1) Paint and wallpaper dealer. Art as hobby. 1949 Frank Boynton (2) Started membership drive. 1950 Frank Boynton (3) Membership over 1000. 1951 Arthur A. Selander (1) Artist. Art teacher. Former Tax Appraiser, registered Civil Engineer in Oregon. Stressed need for new building. 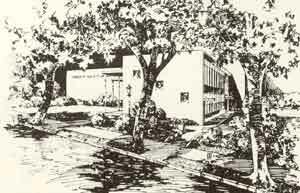 1952 Arthur A. Selander (2) With E. B. Quigley, started sketch groups to finance new building. Purchased land. 1953 Ivan Houser (1) Sculptor. Ceramic Mfg. Started new building first unit. 1954 Ivan Houser (2) Building became reality. 1955 Albert Gerlach (2) Art Glass artist. Rule of Society back to conservative art membership. 1956 Dan Rowinski Military service. Artist and wood carver as hobby. Expanded sketch group activity. 1957 Clyde Leon Keller, Jr. (1) Building Management. Watercolor artist. Expanded traditional art. 1958 Clyde Leon Keller, Jr. (2) Money raising program to pay for first unit of building. 1959 Robert Adams (1) Apartment house manager. Artist as hobby. Started planning second unit of building. 1960 Arthur A. Selander (3) New second unit of building built. 1961 Oscar Haugen Engineer Bonneville Power. Picnic at Amity, and many sketching projects. 1962 Rev. James Alley (1) Preacher, Gladstone First Christian Church. The Society received good publicity for traditional art. 1963 Rev. James Alley (2) Invited Gov. Mark Hatfield to our show. Established Gladstone Art Week. The Society paid off notes of second unit. 1964 Beryl Berry Personnel Executive. Aviator as hobby. Finished our parking lot. Added granite plaques dedicating building to conservative art. 1965 Ben Larsen (3) Artist. Holy Week murals in our gallery. Jerusalem street scene. 1966 Ben Larsen (4) Artist. Very fine exhibits of ecclesiastic art. 1967 Thayne J. Logan (4) An Architect. Opened meetings with Salute and Oath of Allegiance to our flag. Had artist paint-out picnics and good educational art programs at meetings. 1968 Paul Keller (1) Insurance executive and artist. Got good publicity for Society. Started educational items on back sheet of Brushmarks. 1969 Carl Prier (1) Printer and artist. Hobby Archaeology, mainly the stone carvings and paintings of the Stone Age American Indian. 1970 Ashley Russell Very active in conservative art, commercial art. 1971 Dr. Max Zimmerman An artist for recreation. Brewmaster by occupation. 1972 Ree Barron (1) Conservative artist and instructor. U.S. Corps of Engineers (photogrammetric engineer). 1973 Carl Prier (2) A hard-working president and a good purchasing agent for OSA. 1974 Ree Barron (2) Promoted sketching and better exhibits. 1975 Leonard J. Cleary, Sr. A good executive. Promoted friendship and unity. A craftsman in metal. 1976 Robert Adams (2) Helped with mailing Brushmarks and had good programs. 1977 Jean Goin 50-Year Anniversary. First woman president. A good artist. Retired to studio at Depoe Bay. 1978 Carl Prier (3) An experienced president. 1979 Waldemar Nitz (1) A good administrator, with a sense of humor. 1980 Waldemar Nitz (2) A good artist. A fine master of ceremonies. 1981 Doris Barron A good executive officer. Devoted to conservative art.